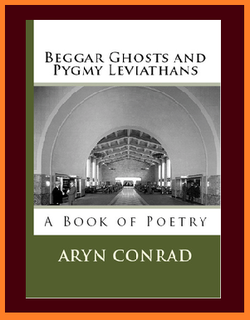 Aryn Conrad has at least two ancestors who wrote poetry but never showed it to anyone. In one case, relatives found a drawer of poems only after she'd died. Aryn aims to break that mold, though she did keep her first poem, which she wrote at 14, secret for a couple of years.A self-styled "philosolawyer," Aryn is currently earning a PhD in Philosophy at Duke and a JD at Stanford, where she did completed her undergraduate degree. As a philosopher, she works on the intersection of philosophy of biology (conceptual evolutionary theory) and metaethics. As a legal scholar, her work focuses on free speech and immigration, particularly asylum. As part of her pro bono work, she volunteers with the North Carolina Immigrant Rights Project. She currently spends three quarters of her time in Carrboro, NC with her husband, a professor of biostatistics at UNC, who argues with her about things like the units of selection, and adores her for it. She spends the rest of the time in the beautiful Bay Area working on her law degree. Conrad was born and raised in Pasadena, CA, and strives to keep a strand of the Californian voice in her poems despite having lived in New Jersey, Florida, and North Carolina. This is her first book of poems.